This image is from a recent wedding near Pittsburgh, PA. We met at the bride's mom's home where the ladies had their hair and make-up done. Laughter, giggling, tears, and lots of chatter go on during this 'getting ready time'. I attempt to get as many images of the bride and the ladies as possible during this prep-time. When time and settings permit, my goal is to get a very unique and memorable shot. In this case, the front of mom's home was in the shade which created a beautiful soft light. I asked the bride to stand on the first step and the posing and lighting sequence began. It always starts with 'smile' (knowing she is looking away from me). It normally generates laughs from the bride and the other ladies standing around which eases some of the posing tension. To keep the process moving, I used everyone available. Behind and to the left of me, a bridesmaid held a gold reflector. Inside the doorway (which is all black in the image) stood a bridesmaid directly in front of her. To the side were other bridesmaids. 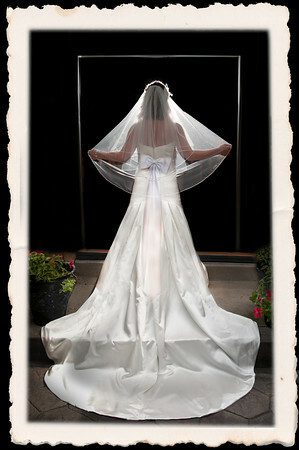 The bridesmaid who was directly in front of the bride held a flash which created the glow in her veil. I showed them the image on the back of the camera and they responded with; "She looks like an angel! ".